Besides worrying for investors and revenue, entrepreneurs need to worry about one more thing now: Aadhaar Card. And in case they still haven’t got one, then they can’t even start a new business anymore! Government of India has now made it mandatory for every new business owner to have Aadhaar Card, without which they can’t register their own business. Udyog Aadhaar – Boon or Bane? Last month, Ministry for Micro, Small and Medium Enterprises introduced a simplified process for registering new business. This move was made after PM Modi stressed on needs of simplified business registration process. This new form, called Udyog Aadhaar was issued on September 18; and as of now, more than 800 new businesses have been registered on this platform. However, if we note the first page of this ‘simplified form’, we will observe that in case the business owner doesn’t have any Aadhaar Card, then he cannot proceed further. Instead of just being another form of verification, Aadhaar Card is now mandatory, compulsory verification, especially for a budding entrepreneur. This forces us to think: Udyog Aadhaar is a boon or bane for businesses? As per some experts of legal matters, this diktat of Government to make Aadhaar Card mandatory for new businesses is a direct violation of Supreme Court’s order regarding the same. Supreme court has categorically stated that Aadhaar Card usage should be voluntary in nature for all citizens. Besides violating apex court’s order, mandatory Aadhaar Card is not feasible in those states where the process of Unique Identification via Aadhaar card has just started; for example, Assam, where only three districts have been covered till date. In fact, MV Ahmed, additional director of industries and commerce in Assam has even asked the Central Government to consider PAN Cards as a valid authentication mechanism, instead of Aadhaar card to avoid confusion. Adapting America’s Social Security system, by implementing Aadhaar Card across the whole nation is a good idea; but the problem is that, we already have so many verification procedures that it is becoming too complex now. In the past, talks were on to make Aadhaar Card mandatory for matrimonial services and even new mobile connections. Although Aadhaar card usage has made tax filing easier, but at the same time, it is giving rise to online frauds as well. Voter’s Card, PAN Card, Passport, Ration Card and now Aadhaar Card.. While some of these cards are applicable in some of the schemes/new plans; not all of them can be used everywhere. Indian citizen, especially an entrepreneur is certainly confused now. 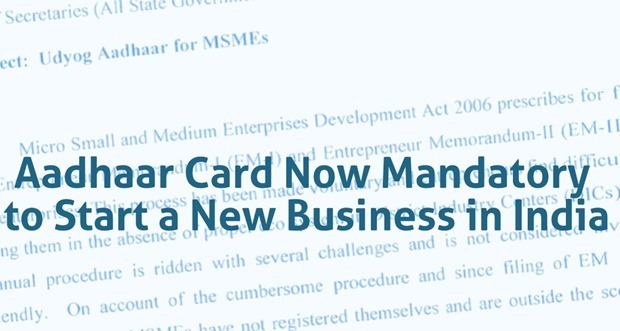 Do you think Aadhaar Card should be made mandatory for starting a new business? Do share your views by commenting right here! People !the only direct resistance to this Adhaar -crazy government is to do everything that will not require Adhaar card –Do unregistered business , do cash transactions ,etc If ever you get to trouble then defend yourself by counter accusing the government that it has made Adhaar mandatory despite the court rulings. This Guju bilionares’ sponsored road to Anarchy in disguise of Democracy must be given stiff resistance It is now or never before the Indians are forced adopt Guju culture as the World is forced to go American . Rest of India re you awake??? or the banana looks quite long and straight ,No?? We will go to supreme Court for further orders to clarify whether its mandatory. If its violation of court order , we shall seek justice for contempt of court. Those implementing as mandatory should be severely punished by Supreme Court. Aadhar card should not be mandatory as it violates everyone’s privacy. A stupid idea by UPA government which is now followed by BJP government also. Is this card also required from foreigners setting up a business in India? The main problem is that it has not been ratified by parliament. Otherwise, there is no problem with it. It’s a shame for Indian Govt. Because, the general public do not know how and where to get Aadhar card. Also they believe that it is a toughest task to do in this democracy. Do not force Aadhar card on people, or make it simple to get it.